Greenshields JCB is helping with the power generation requirements for a contractor working on the site of the former Ford Motor Car plant in Dagenham, East London. Beam Park is a 29-hectare site which was granted planning approval for a £1bn development of up to 3,000 new homes by the Greater London Authority in 2018. The plan includes the construction of a new rail station, two primary schools, a nursery, community facilities, retail and open spaces as well as the new homes; 50% of which will be much needed affordable properties. Wembley-based Carey Group has been appointed as a contractor to provide groundworks and demolition services on the historic site; which was also the backdrop for the British film Made in Dagenham. An existing customer of Greenshields JCB, the company – which celebrates its 50th year in business in 2019 – is committed to resource recovery in the construction sector. At Beam Park an aggregate recycling plant has been established to recycle, refine and reuse materials from the demolition of the old facilities. 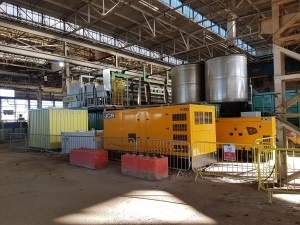 The prime power to run the screening plant was originally provided by a rented generator with an output of 1000kVA and this generator was also used after hours to run some low load bearing tasks such as lighting and electric. Managing Director of Careys Plc, Gary Condon, suspected the unit was the inappropriate size for the work and was equally concerned by the very high fuel consumption. He and Site Supervisor, Andy McLachlan, called Luke Wood, Greenshields JCB Power Generation Manager to discuss and a site survey was ultimately undertaken. The findings confirmed the suspicions. During peak hours in the day a generator generating 500kVA output was required, whilst to manage the lower power demands during the night a unit generating just 100kVA would be sufficient. As well as huge savings in fuel consumption and lower noise levels the carbon footprint of two smaller units was also way lower.